Luke Kunin: "I want to be a winner wherever I go"
Luke Kunin has had the special touch on most every international team he has ever played on. Now a former University of Wisconsin Badger, Kunin hopes to help push the Iowa Wild into the Calder Cup playoffs for the first time. 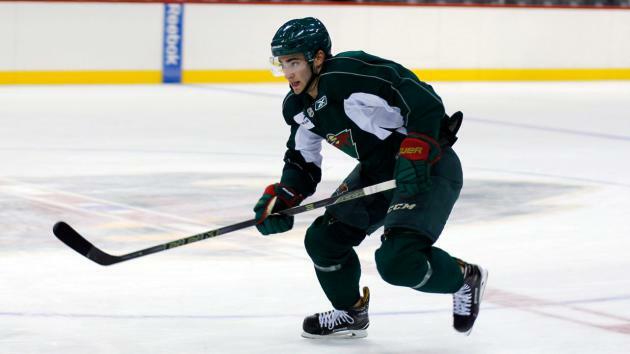 Kunin, drafted 15th overall last June by the Wild, will make his Iowa debut Friday night in Cleveland after he signed an amateur tryout Thursday. That followed agreeing to terms with Minnesota on a three-year, $2.775 million contract, plus performance bonuses (his 'A' bonuses are representative with a mid-first-round pick of his pedigree), that’ll kick in next season. Iowa, which has 12 regular-season games left including two in a row in Cleveland, ranks fifth in the Central Division with a .531 points percentage. The top-four in each division make the playoffs, and Charlotte is fourth at .540 and Cleveland sixth at .523. So Kunin’s arrival comes at a good time. Kunin, who has played center mostly for USA Hockey, played wing down the stretch for the Badgers and will initially start at right wing on a line with Ryan Carter and Pat Cannone with Iowa, said coach Derek Lalonde. He may eventually get a look at center. Kunin, 19, the first sophomore to captain the Badgers in 41 years, led the team with 22 goals and 38 points in 35 games one year after leading them with 19 goals. The 2016 Wild first-round pick captained the United States to gold at the most recent world junior championships. During his career, Kunin has represented Team USA at seven international tournaments - winning the championship six times and finishing second once. He captained the U.S. to a gold medal at the 2015 IIHF World Under-18 Championship, leading the team and ranking T-3rd in the tournament with six goals in seven games. Kunin said talk of signing immediately with Minnesota was brief. The Wild didn’t want to burn the first year of his contract, nor thrust him right from college hockey into an NHL playoff run. After losing in double overtime of the Big Ten championship to Penn State, Kunin went to St. Louis with a couple teammates to root on the Badgers’ women’s team, which includes his girlfriend, Wayzata’s Sophia Shaver, in the Frozen Four. After the tournament, Kunin stayed in his hometown to decompress from the season and talk to his parents about the decision he had to make. He stayed in contract with Badgers coaches Tony and Don Granato and Mark Osiecki. He wanted to gauge their advice. That’s why Kunin thinks these next 12 games and hopefully beyond will be valuable. Miami University junior defenseman Louis Belpedio, a third-round pick in 2014, is also mulling over whether it’s time to turn pro, said Rutili, who also advises Belpedio. Minnesota's teams: What are the best-case and worst-case outcomes?